The GoldRush fibre optic connector. AMPHENOL Fibre Systems International (AFSI) has designed the next generation "longwall communications" deployable fibre optic connector. By responding to specific customer needs and leveraging the family of AFSI TFOCA-II connectors, the GoldRush series of fibre optic connectors was born. These innovative interconnect solutions have become an enabling technology for "digital mining." AFSI's GoldRush connectors address specific mining requirements for the future of intelligent mining. The GoldRush connectors are the only Mining Safety and Health Administration (MSHA) certified fibre optic connectors for use in underground mines under Title 30 CFR, Part 18. 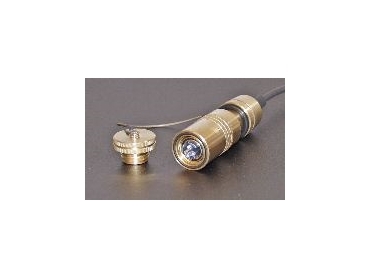 The heart of the GoldRush family of deployable fibre optic connectors is the TFOCA-II termini, featuring "sealed" free floating termini. This revolutionary design enables GoldRush connectors to seal against high humidity and moisture conditions while allowing full axial and orbital movement of the mated termini, providing the lowest possible insertion loss. * Hermaphroditic design for versatility - Enables the GoldRush plug to be daisy-chained or unreeled from either end of a reel. * Brass construction - Eliminates thermite concerns. The connectors are also available in stainless steel (for corrosive environments) and aluminium. * 4-channel connector design - Provides system flexibility. * Optional key positions - Four key positions (1, 2, 3 and universal) are available, enabling segregation of mated plug/receptacles or plug/plug, through mechanical interface. * Improved cable retention strength - Designed to meet 400lb pull strength while protecting fibres from stress. * Solid core alignment sleeves - More robust than split alignment sleeves. * Removable end cap - Allows for easy field repair and cleaning. * Commercial ceramic ferrule technology - Enables GoldRush connectors to provision multimode and single mode interconnect with a variety of polishes including SPC and UPC. * Field repairable using existing parts - Additional connector components (other than termini) are not required to perform field repair.